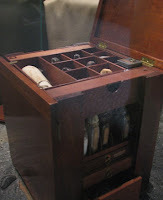 Before visiting the new Gettysburg Visitor Center, I didn't know that General Lee even had a medicine box. The center's museum houses clothing and war relics from, and features short films about, the American Civil War. The layout is a conglomeration of displays in a dimly-lit maze of walls, media screens, and glass cases. Very atmospheric. You could easily spend hours admiring artifacts and reading and viewing film about the war. 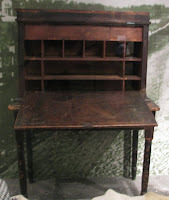 Halfway through the museum I happened upon these unexpected gems—General Lee's medicine box and campaign desk. The photos are out of focus because all pieces are behind glass and flash is not permitted. 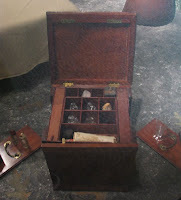 The medicine box, I'm guessing, is about 14" tall,12" wide, and 12" deep, and is filled with little cubbies and tiny drawers. The cubby partitions are only about 3/32" thick. 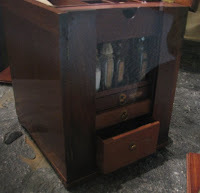 Both sides of the case are removable and were laying beside the cabinet. The front opens like a door and I believe the wood is cherry. The campaign desk may be walnut. My only thought upon viewing the cabinet, after closing my slackly-opened jaw..."I must build this someday." I hope to gain access to this piece in future in order to take measurements and detailed photos. The museum opened within the last year, so access to the relics will not be allowed for some time. But I did obtain the curator's phone number and plan to contact him about it, using my best "nice lady" voice. Wish me luck!